University of Texas Press, 9780292743632, 243pp. Would you like your children to grow up bilingual, even if you aren't yet? Then speak to your kids in Spanish as you learn the language along with them. Becoming a Bilingual Family gives English-speaking parents the tools to start speaking Spanish with their kids in their earliest years, when children are most receptive to learning languages. It teaches the vocabulary and idioms for speaking to children in Spanish and offers practical, proven ways to create a language-learning environment at home. 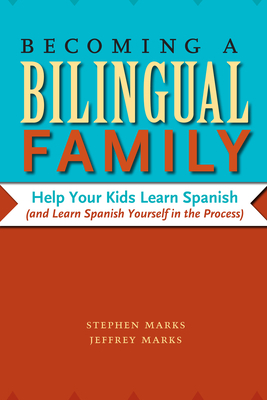 The first part of the book introduces parents to many resources--books, audio books, music, television, computer programs, childcare workers, school, and friends--that can help you establish a home environment conducive to the acquisition of Spanish. The second part is a Spanish phrasebook that takes you through all the typical activities that parents and children share, from getting up in the morning to going to bed at night. Few, if any, other Spanish study aids provide this much vocabulary and guidance for talking to small children about common daily activities. The authors also include a quick course in Spanish pronunciation and enough grammar to get a parent started. Spanish-language resources, kids' names in Spanish, and an easy-to-use index and glossary complete the book. Take the Markses' advice and start talking to your kids in Spanish, even if it's not perfect. You'll learn the language together and share the excitement of discovering the peoples and cultures that make up the Spanish-speaking world.